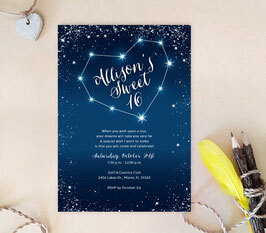 With our Constellation Quince Invitations you can have your party details up there among the stars. These Quince Invitations are beautifully decorated with a sparkling heart constellations, stars and fantastic calligraphy. 5x7 Quince invitations with envelopes.